Our next interview gives us a behind the scenes look at how one city was forward thinking enough to realize the impact live events can have on its city and its citizens. Frankly, I’m really surprised more cities don’t jump on this train. The Baltimore Office of Promotion & The Arts (BOPA) is a nonprofit special events agency, arts council and film commission. 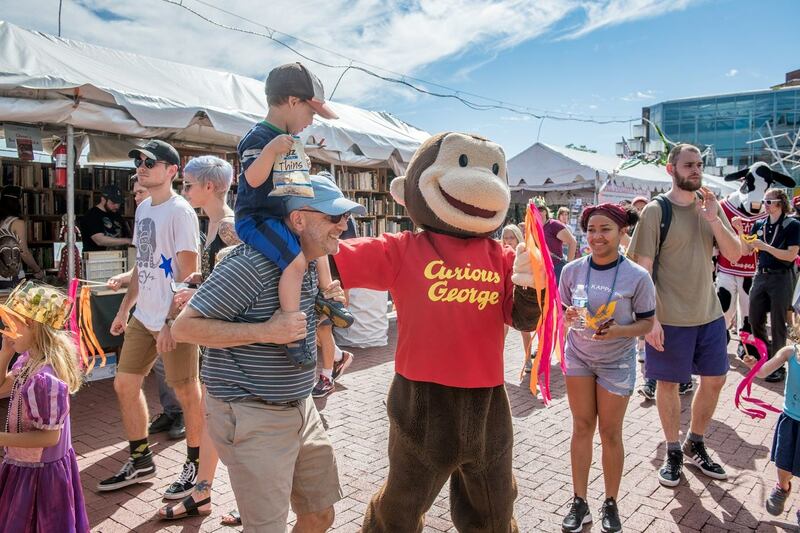 BOPA’s portfolio of world-class festivals (Artscape, Baltimore Book Festival and Light City) attract nearly one million attendees annually and generates $66 million in economic impact for Baltimore. Not bad for a predominantly self funded non-profit. So of course, I was really excited to talk to Kathy. I knew she’d provide some incredible thoughts, advice and experience. Advice for navigating and working with city officials to produce an event. The operational challenges and opportunities when combining to successful events into one. The importance of community involvement and feedback to help set the strategy of an event. How do deal with some of the biggest operational challenges of a city wide event. How other cities can emulate the success of Baltimore Office of Promotion and the Arts. Career advice for working in the event world. I grew up in Annapolis, Maryland. I graduated from Annapolis High. If I was at a family barbecue and chatting it up with your friends, how would they describe you? Well, I've always been kind of a party girl, so the fact that I ended up in festivals really isn't a surprise to them. I'm usually the one that they tap to bring my crab dip to the family barbecue (I just brought some dip to work for everyone today). My friends also know I'm a big sports and auto-racing fan (my favorite part is the festival-like vibe! ), but I'm also really into the arts and always have been. You had me at crab dip Kathy. If you had to choose one, which would you go with: Hard shell, soft shell, or crab cake? Way to bring it back to events Kathy. I understand you were an English major in college. So how did you get into the world of events? I was an English major at St. Mary's College of Maryland and I was lucky enough to spend a semester at Oxford studying Medieval and Renaissance literature. My dad sat me down one day and he made me look up jobs under Medieval and Renaissance Literature in the Sunday Washington Post want ads to prove to me that there was nothing in that field short of academia. So the trade off was that I could go to Oxford, but I had to do an internship in my last semester so that I could get some skills that would lead to a job. So my internship was at Baltimore Office of Promotion at the time. That was before we had the Arts in our mission. I was a copywriter, using my English degree. I did copywriting for the office, and then one or two years into that gig my boss came back from the Edinburgh festival, sat down in my office one day, and said, "You love books, right? And I said, "Absolutely.” And he said, "I think Baltimore should have a book festival." I was like, "I do, too." And before I knew it, I was planning a festival, and my trajectory changed from writing and publications to special events and festivals. Did you ever imagine the Baltimore Book Festival would be as big as it is? I always hoped it would be, but no. It took us a couple of years to build that audience and for people to realize that you could celebrate books and have a good time doing it. So the fact that we're at 100,000 people if we have a good weekend with good weather, it's really amazing and it's so gratifying as a book girl to see that many people turn out to celebrate literature. How is the Baltimore Office of Promotion & The Arts connected to the City of Baltimore? We are a completely independent non-profit organization. One of the bigger challenges we have when telling our story is that we are a non-profit; we are not city government, but we have a very close relationship with the city. Our CEO sits on the Mayor's cabinet, and always has, as a signal of how important arts, culture and tourism are to Baltimore. As a non-profit we receive an operating grant from the city, but it does not nearly cover all of our expenses.. We have to go raise a lot of money to produce the different events and festivals and arts initiatives we do for Baltimore. Do other cities have a structure like this? What is the economic impact of the special events and festivals you work on? It's huge. These events generate amazing return on investment for our sponsors (which includes the city), in terms of visitors coming into downtown, whether they're from out of town or out in the suburbs or city residents who are enjoying the restaurants and the hotels and the nightlife and they're parking in garages, etc. Beyond that, the impact, economically, that these festivals have on the artists themselves is incredible. Our strong festival culture here in Baltimore is one reason that our art scene is so strong, because BOPA pays all of our artists to perform. We commission visual artists to create new works. We have an artist's market at Artscape that his highly competitive because folks come to Artscape to buy art and build their art collections. It’s also an incredible opportunity for our artists to build new audiences. We really produce these festivals from that perspective of how the arts can transform and have an impact on our city. Given the economic impact I'm curious why other cities wouldn't have this? You know from spending your summers here, Baltimore is such a unique and wonderful city. The festivals are really a part of the culture here, and it requires creative and innovative thinking to see how the power of the arts and events can manifest themselves in that way, and maybe it just takes that special Baltimore spirit to see how a special event can go from a fun idea to something that has impact. Do you have any advice for another city who was thinking about forming something like BOPA? Well, it's really important to identify funding sources. I mean, that's the biggest challenge in the not-for-profit arena, is making sure that you are fiscally responsible and raise the money that you need in order to produce your event. Beyond that I think it's really important to truly listen to the community and make sure that the events and festivals are something that the citizens of the city want to see and want to be a part of, and that it always feels authentic and something that's happening with them, not to them. A good example of that was when we were launching Light City. We were about six months into the planning process when the Freddy Gray uprisings happened here in Baltimore, and so we took a deep breath, (as professionals working in the city and as residents and lovers of the city), to make sure that Light City was still something that folks wanted to see happen, and that it felt good to them to be launching this huge light art festival in the context of everything else that was happening in Baltimore. 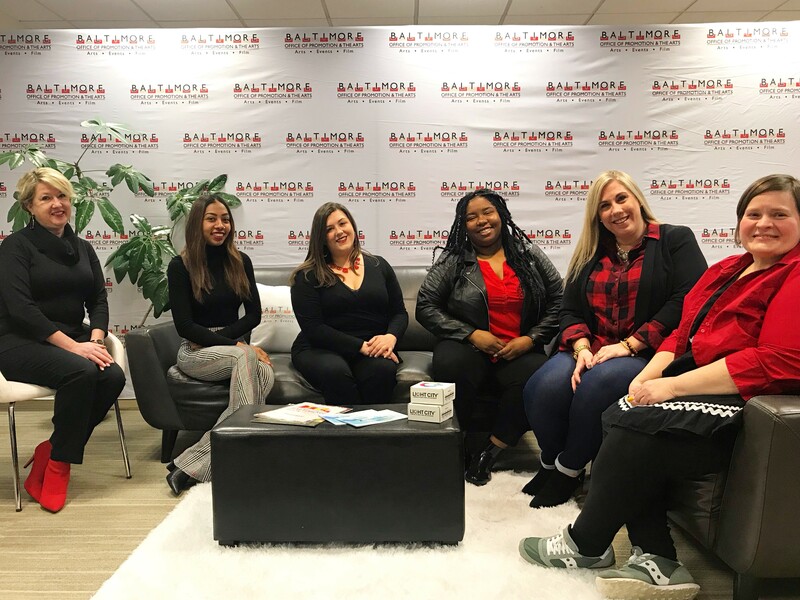 So we had a series of community convenings and listened to our customers, if you will, the citizens of Baltimore, and you know, in that instance we heard loud and clear from them that they really wanted to have a platform to shine a light on all the positive things that happen here in Baltimore. I understand your team, recently combined two very successful events (The Baltimore Book Festival and Light City). What were the strategic items you and the team considered in making that decision? It came from a couple of different points. Probably the biggest pivot for the Baltimore Book Festival was that we had been speaking with our official book seller, the wonderful, independent Ivy Bookshop here in Baltimore about pushing the festival later into the fall season. We both had noticed some changes in the publishing industry, with titles were dropping farther away from Labor Day and closer to the holidays. At the same time, we were really taking a look at the feedback that we got about Light City after our first three years (both good and bad), from our festival goers, sponsors, artists and stakeholders. One thing we kept hearing over and over was that when Light City was in April and the fact that it really didn't get dark until after 8:00pm was really prohibitive, especially for the people who work in downtown Baltimore to stick around on the weeknights. We would have these huge crowds on the weekends at Light City, to the point where people were going, "We're going to need to build a bigger Inner Harbor if Light City is going to be this successful." And then on the week nights, particularly if we had even a hint of bad weather, it was not as very well attended. 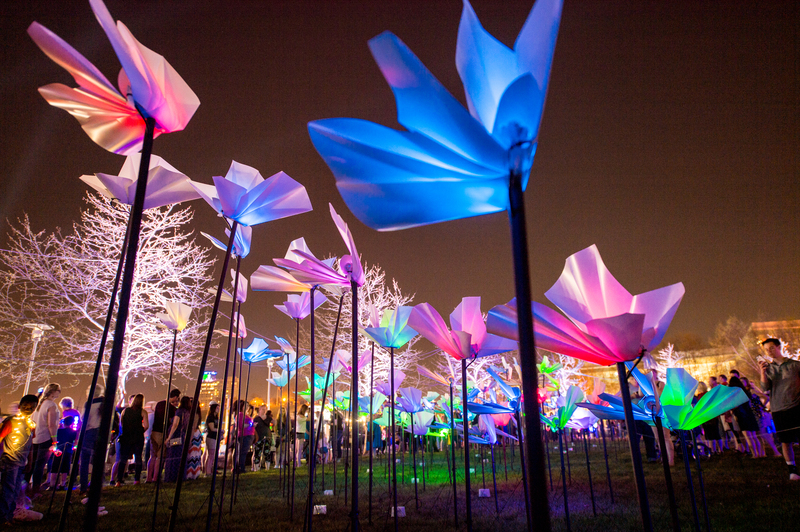 So we started to think about moving Light City to the fall after daylight savings time ends. So at this year's Light City, it'll be fully dark by around 5:30 pm so folks can pour out of the office buildings and come on down to the harbor and enjoy the art in its full glory. So as we were thinking about moving Light City to the fall and the Baltimore Book Festival to later in the fall, we realized we had a powerful concept: illuminating Baltimore with literature, ideas and innovation during the day, and then illuminating Baltimore with spectacular works of light art at night. It seemed so unique and really cool and inspirational that we decided to unite the two, and here we are. What are the operational challenges and efficiencies you are seeing by combining the two festivals? One of my “golden rules” of the festival world is that when you make a change, usually you're just trading one set of issues for another. But in this particular case, we do see some real benefits, especially with our staff and having them out in the field doing a major production down at the Inner Harbor once, instead of once in April and then coming back in September for the Baltimore Book Festival. It also gives us a little more time to plan, since we don’t have to execute a Light City this April. BOPA’s full-time festivals department “task force” is a team of five, so we’re still figuring out how we're going to staff during the day and at night, all the exhibitors, all the authors, all the light artists and all the events that will be happening in the neighborhoods. But we’ve figured it out before, and we'll figure it out again. Our festivals department works collaboratively with our BOPA colleagues across all departments – special events, the arts council, film, facilities, communications, admin, development– and we are one team, one dream when it comes to executing these large-scale endeavors. What are are some of the operational challenges that you and the team face working on these large festivals? The fact that the majority of what we do is outdoors, number one, is always the weather. 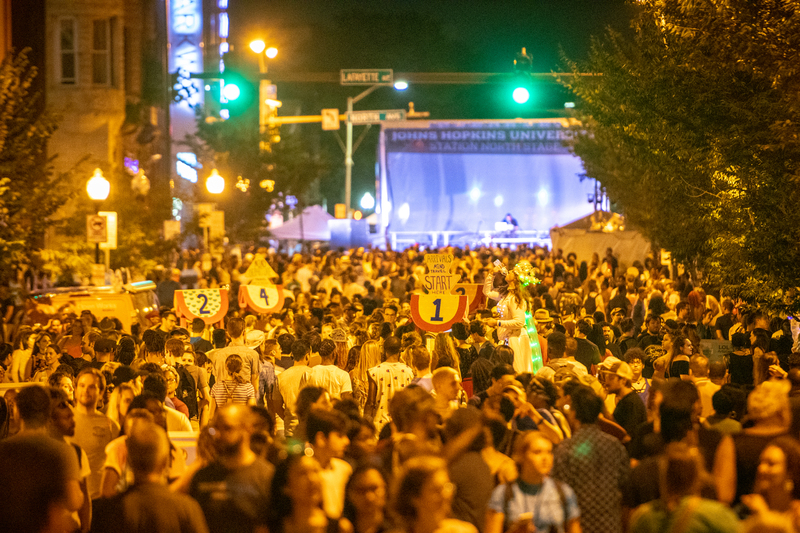 At Artscape, we traditionally close about 16 city blocks to do that festival. Artscape's been doing that for almost 40 years in that neighborhood, so working closely with our neighbors to minimize impact is important to us. That said, the impact on people who live and work in the neighborhood, with those kind of street closures, is a challenge – we call it the eggs we have to break to make the omelet. At the harbor our biggest challenge is the wind and the weather and making sure that all of our spectacular pieces of light art can withstand all the worst case scenarios (gale force winds and lighting! ), while we plan and hope for the best. Do you have any advice for event companies on the best ways to navigate working with a city? I would definitely recommend trying to find one key point of contact that can help you navigate each city's permit and approval process. 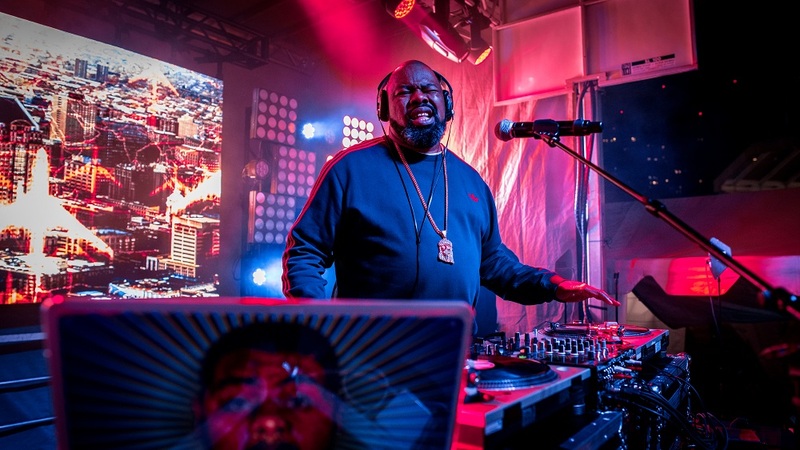 Every city is different; Baltimore is no different in that we have a process, but the most forward-thinking cities, (who recognize the power of these events to not only unite people in joy and celebration but also who spend their hard-earned money), make it easier for promoters and event producers to do their jobs. So certainly anyone interested in doing an event here in Baltimore, we welcome you to start here at BOPA and we'll try to send you down the most efficient path. Do you have any career advice for those working in the event world? You have to be passionate about the power of events and festivals in order to truly maximize the event that you're working on. People want to have authentic experiences and they want to connect with people in really meaningful ways, for those brief moments that they're not on their phones and they're at a festival, and they're enjoying the music and the art and the performance and the food and all those things that connect us as people on the most basic level. You have to have a passion for that for your event to be a success. Of all the other things that I think are so important, number one is that you have to be organized and number two you have to be creative. People who are highly organized aren't always creative and vice versa. I've found that the people who are the most successful in this business are a strong mix and balance of the two. But you've got to have the passion because it's not an easy business. Everyone always says, "Oh, you work in festivals that sounds like so much fun." Well, it's fun to go to a festival. It's fun to attend a festival, and it should be fun to work on a festival, but it's an incredible amount of hard work, and without that passion and that drive, you won't be successful, and neither will your event. Lennd is a next generation event and venue management platform that simplifies operations and logistics so event teams can work smarter, move faster, and improve their ROI. From tracking and managing requests, orders and allocations for credentials, comp tickets, documents, catering, inventory, guest lists and applications to on-boarding vendors, artists, sponsors, suppliers, staff and crew, or any other group, organizations have everything they need to deal with the demands of today’s complex events, all in one central place. Users can move seamlessly from one function to another based on their access level in a fully integrated system. 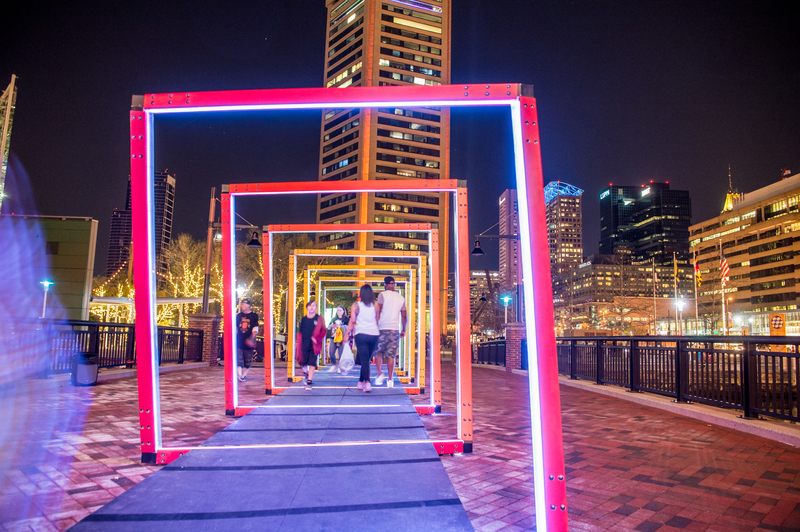 The 2018 Light City attracted an estimated 442,500 guests to Inner Harbor/downtown Baltimore over the 8-day festival, April 14-21. Light City opening night broke attendance records, with an estimated 175,000 visitors enjoying the event. Another estimated 3,600 people experienced Neighborhood Lights, April 6-8. The 3rd annual Light City Festival had a total economic impact on Baltimore’s business volume of $33.5 million. Light City directly increased the local business volume by $19.72 million and $12.73 million in indirect impact. 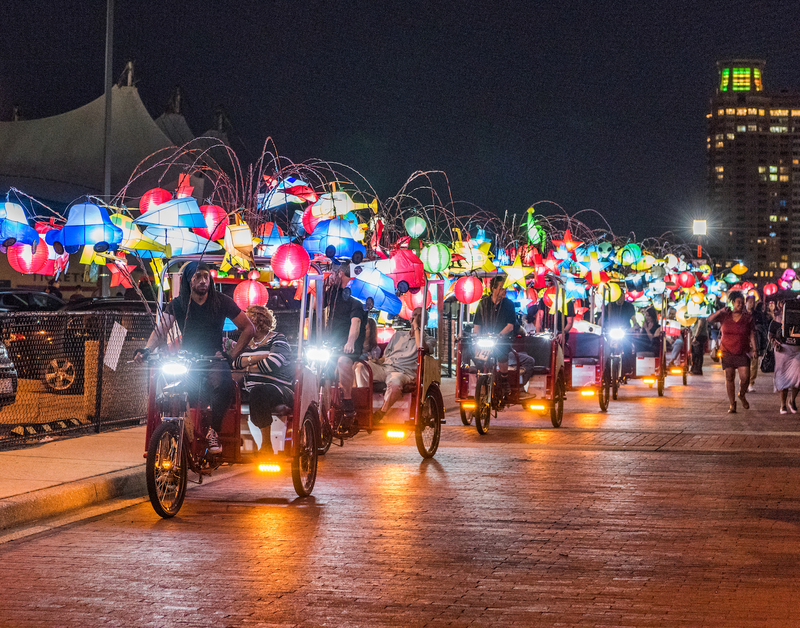 The government revenue impact attributable to 2018 Light City is estimated $1.26 million for the State of Maryland and $384,851 for the City of Baltimore. The 2012 Artscape had a total economic impact on the City of Baltimore business volume of $28.5 million, comprising $7.7 million in direct impact and a further $20.8 million in indirect impact. Direct spending by nonresident Artscape attendees generated $462,583 in sales tax revenues for the State of Maryland. 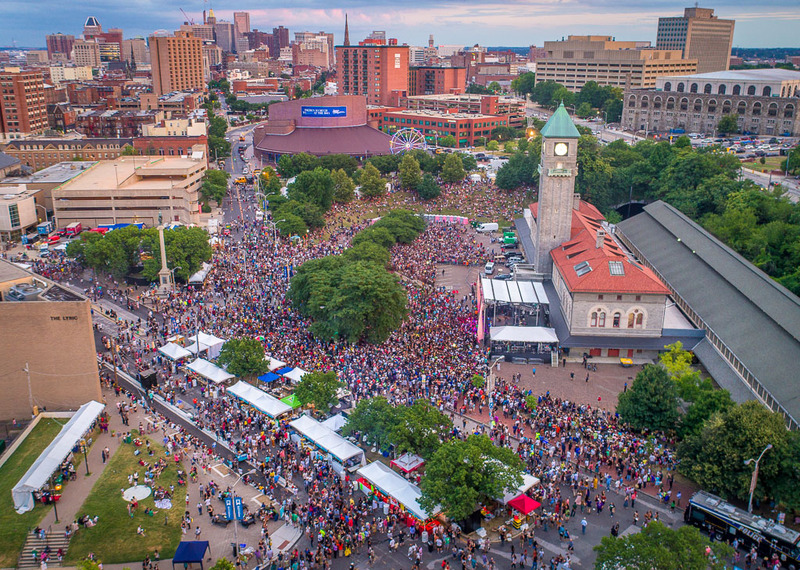 In previous years, the aforementioned sources estimated Artscape attendance at 350,000. The 20th Baltimore Book Festival attracted an estimated 100,000 visitors to Inner Harbor over the three-day event, September 25th to 27h, 2015. 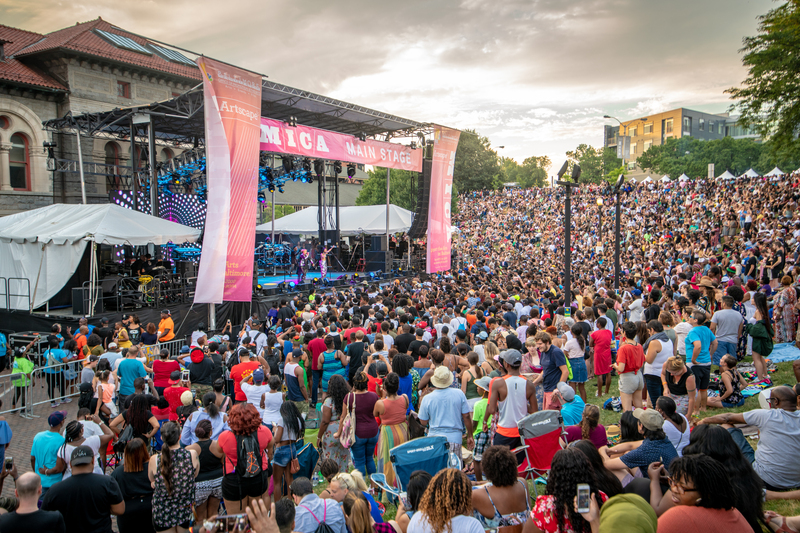 Survey research shows that approximately 32,500 Baltimore residents experienced the event, another 44,500 reside elsewhere in Maryland, while an overwhelming 23,000 visitors came from out-of-state. The total economic impact of the 2015 Baltimore Book Festival is estimated at $8.30 million for the three-day literary event. Baltimore Book Festival increased the local business volume by $2.58 million in direct impact and $5.45 million in indirect impact.